﻿ MotoGP wings - do we really need them? Winglets have taken MotoGP by storm this season. But many riders and MotoGP bigwigs want them banned. So, what’s the big deal? otoGP bikes are not normal motorcycles – they make around 260 horsepower and nudge 220mph. They need things that you and I don’t, but do they need wings? MotoGP’s wing man is Aprilia RSV4 designer Gigi Dall’Igna, who joined Ducati Corse at the start of 2014, charged with reinvigorating Italy’s ailing MotoGP force. Dall’Igna immediately started investigating an area of performance that until then had been largely ignored: aerodynamics. Ducati’s Desmosedici briefly sprouted wings in 2008 and 2010, but last year it had two, then four, then six. The aerodynamicists at Ducati Corse were searching hard for solutions. But solutions for what? Mainly increased front-end downforce and better straight-line braking. Wheelies are a problem in any gear for a MotoGP bike. 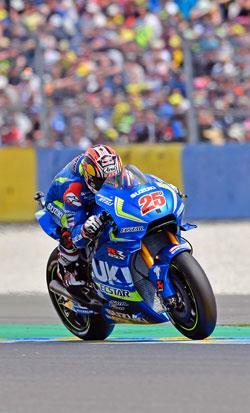 Without help, the rider will expend lots of energy – physical and mental – trying to tame the front end, and he will also lose speed while feathering the throttle. That’s why anti-wheelie electronics were introduced in the early years of MotoGP. They help the rider go faster by allowing him to concentrate on other stuff. The problem is that anti-wheelie electronics use torque reduction to minimise front-end lift, which hurts acceleration. Dall’Igna’s bright idea was to use aerodynamics instead, a bright idea that made even more sense following the recent introduction of lower-tech control electronics. 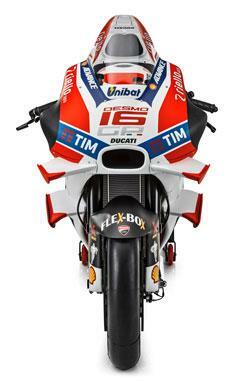 Ducati won’t reveal exact downforce figures but their wings probably add a maximum of 10kg to the front end. But what about drag? You can’t have downforce without drag, so surely the wings must reduce top speed? Apparently not. The Ducati almost always tops the maximum speed figures, so Dall’Igna’s aerodynamicists are clearly doing a great job. And of course it does help that they have the most powerful engine on the grid. Dall’Igna has been very clever to exploit MotoGP’s rules to their limit, which, after all, is his job. Regulations demand that wings must not extend beyond the width of the fairing, which Ducati’s never have, if only because at one stage they widened the Desmosedici’s fairing to accommodate bigger wings! Wings are nothing new in bike racing. Almost half a century ago, MV Agusta – in the thick of a 17-year unbeaten run as 500 world champions – watched Formula One cars grow aerofoils and wondered if downforce would also make motorcycles go faster round corners. They attached a set of wings to Phil Read’s MV at super-fast Spa-Francorchamps in 1974, but the wings were never seen again. In other words, they didn’t work very well. In 1978, Kiwi bike racer and boffin Rodger Freeth, studying astrophysics at Auckland University, used the uni’s computer to churn out downforce versus drag figures at different speeds and lean angles. Then he proved that genius and madness are indeed close allies by building wings for his 180mph TZ750 race bike. The wings were huge: the rear measured almost three quarters of a metre across; the front was 600mm wide. Freeth raced the winged TZ, battling for the lead and enjoying more stability through fast corners and on bumpy straights. So they worked, up to a point. But there was a problem. Freeth’s rivals didn’t like the wings, which they feared would cause collisions, so they were banned. Wings returned in the early days of MotoGP, when Aprilia and Ducati briefly tried them, but once again they didn’t stay around for long. Yamaha were the first to realise Ducati were onto something with their wings. Late last season they screwed small wings to the fairings of the YZR-M1. Jorge Lorenzo liked them, Valentino Rossi didn’t, because he couldn’t feel any difference. Yamaha’s wings grew considerably for 2016, then Honda fitted similar devices to their RC213V, and everyone else followed. While this development was underway, Dorna, the FIM and teams’ association IRTA – decided they wanted to ban wings on safety and costs grounds.